Here we come with information about U.S. Eddie Bauer Friends & Family Event. Take 40% off your purchase when you shop at U.S. Eddie Bauer store locations or U.S. Eddie Bauer online. Includes clearance styles. Online use the promotion code CARABINER at checkout. 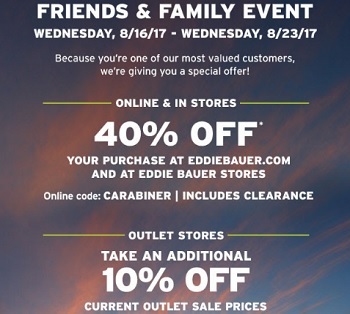 You can also get a discount when you shop at U.S. Eddie Bauer outlet stores. Take an extra 10% off current outlet sale prices. Offer is valid until August 23, 2017. Source of the information is Eddie Bauer. For more details about the offer see any U.S. Eddie Bauer store location or U.S. Eddie Bauer online.